I wasn’t too far into my guide on how to dress like Damon when I realized…he owns a lot more jackets than I thought. I wasn’t going to be able to fit as much detail as I wanted about Damon’s different jackets into that guide. ​Leather jackets are definitely Damon's favorite type of jacket to wear. Whether he's dressing casually or dressing up, Damon almost always includes a leather jacket. ​Since he loves wearing leather jackets, Damon has to have enough of them, and in enough different styles so that he can wear a leather jacket with every outfit. And those are good things. In my mind, Damon's style pretty much revolves around his leather jackets. What Kind of Jacket is it? ​His favorite leather jacket has to be the black, four-pocket one with the flat collar. ​The older Salvatore brother wears it throughout the Vampire Diaries series. Damon may have an extensive leather jacket collection, but he always returns to this one. ​It's not too big of a surprise since the jacket seems like it goes with pretty much everything. It's nice enough that Damon can wear it to more formal events, but he can also wear it with jeans and it still goes together. ​Although the Vampire Diaries' costume designer mentions that Damon wears a lot of John Varvatos clothing, she doesn't mention the exact model of his leather jacket. ​I looked around for quite a while, but just like most clothing used in television shows, I don't think Damon Salvatore's classic four-pocket leather jacket is made anymore. ​So where can you buy this jacket if it's not made anymore? The only thing I found was a replica made by Soul Revolver. ​If you're unfamiliar with Soul Revolver, they're actually a very well known maker of replica film jackets. And from what I've seen, they do amazing work. ​Their replica jackets tend to cost a bit on the high side, but it's definitely worth it if you're looking for a high quality replica of Damon Salvatore's jacket. ​Damon's four-pocket leather jacket might be his most recognizable, but my favorite jacket of his is the moto-style leather jacket. I think I like it so much because it just looks so clean. The front is broken up by four large pockets like Damon's other jacket. ​I also like the collars of moto-style jackets. Where most jackets have collars that fold down (like a dress shirt), these style jackets have collars that stand straight up, and aren't even meant to fold down. ​Plus Damon looks like a total badass wearing it. 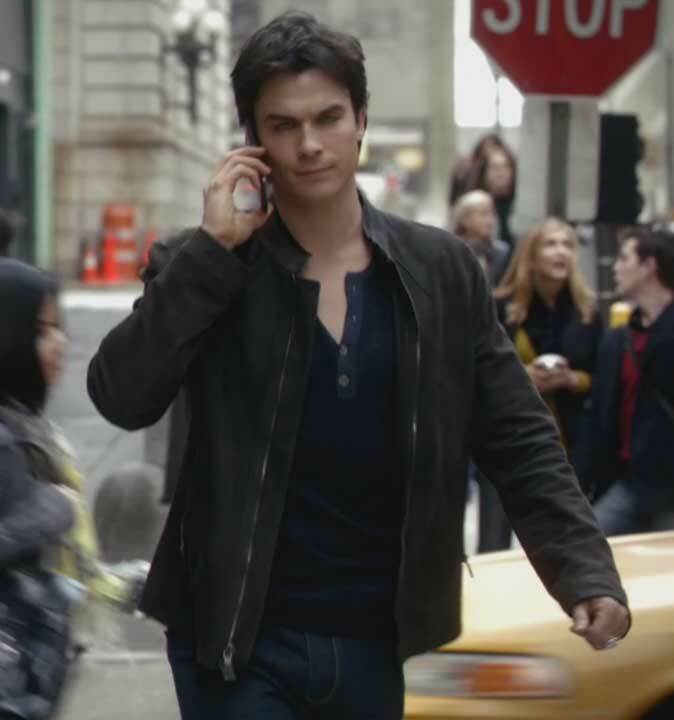 ​Again, Damon wears mostly John Varvatos, so we'll assume this jacket is a John Varvatos as well. Going by that, there are a couple of John Varvatos moto-style jackets that looks almost identical to Damon's. 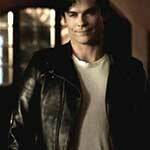 ​This John Varvatos moto leather jacket is the closest one I could find to Damon's. ​It is a bit on the expensive side, so if you're looking for something a lot cheaper, you should check out this Kenneth Cole moto jacket. It looks pretty close to me, plus if you're just planning on dressing like Damon Salvatore a few times, you'll save money on something you aren't going to wear very often. ​This is probably my second favorite jacket of Damon's. It has the same general style as his moto jacket, but instead of the short moto collar, this one has a normal fold-down collar. ​Another slight variation this particular jacket has when compared to the John Varvatos above is that it has large buttons on the front. The John Varvatos moto jacket just has the zipper. I originally assumed this jacket would be a John Varvatos too, but after looking further into it, it's more likely a Diesel jacket. ​As far as I can tell from just looking at pictures, the exact jacket Damon wears on the Vampire Diaries is this Diesel L-Bunmi leather jacket. The breast pockets/zippers are in the same spot, the collar looks the same, and even the large buttons/snaps look identical. ​As far as I know, the only times we see this particular leather jacket are in flashbacks of Damon. ​The jacket itself is just your stereotypical "biker jacket", with it's huge collar, multiple pockets and large zippers. The particular jacket Damon wears also looks like it has a red inner liner, which adds a bit of originality to the jacket. ​I know I keep mentioning that Damon wears mostly John Varvatos jackets, but this is one jacket that I know isn't a John Varvatos. ​What brand is it, then? I'm not sure, but a lot of leather jacket companies make this style. This classic biker leather jacket is the closest match I could find to the one Damon wears, and honestly it looks almost identical. It even has the red inner lining. Another John Varvatos jacket, this one is REALLY nice. It's nice and simple, with a small collar, and a small amount of pockets. ​I really like suede jackets, but they tend to be on the pretty expensive side, and can be ruined very, very easily. ​As with pretty much all of Damon's fashion, he wears it in a dark grey/black color, so it goes with anything he wears. ​John Varvatos! Big surprise...Damon's suede jacket is made by John Varvatos, and you can get it here. ​Suede can be expensive, but if you're just looking for a jacket that looks like Damon's, I found this polyester jacket made by Flatseven. It's a lot cheaper than the exact one Damon wears and keeps the same look/style. Thanks Chuck 🙂 I never thought about doing shows like Dark Matters, but it’s a definite possibility.